We all love pictures of clean, clutter-free spaces and drool over the beautifully organized HGTV houses! However, our own spaces rarely seem to look or feel that way. It seems like there’s always something piling up (laundry, paperwork, kids’ toys, dishes, and the list goes on and on) that makes our space feel messy and unorganized. We always have good intentions of keeping everything clean and put away…but then life happens, things get busy, and the piles continue to grow. All of this clutter can make us feel stressed out! No one wants to get home and walk into a messy space! It can be frustrating to see the clutter, but not know how to get rid of it for good! We’ve rounded up five practical, easy, and cheap de-cluttering tips and tricks to help you take control of the clutter and love your space again! Merisa, of Monogrammed Magnolias (linking to Pinterest, because her website is no longer live), has a handy, practical list of 60 things that you need to toss in the next 60 days. Oftentimes, when we actually start going through our piles of clutter, we realize that we don’t even need most of it. Get started on throwing out the stuff that you don’t need, to get on your way to a cleaner, less messy and less stressful space! Get Your Paperwork in Order! Paperwork is one of the most common, cluttery things in our homes! We’re always getting paperwork in the mail, not knowing if we need to keep it or where to put it, and then setting it down to collect in an annoying pile that we eventually just throw away. 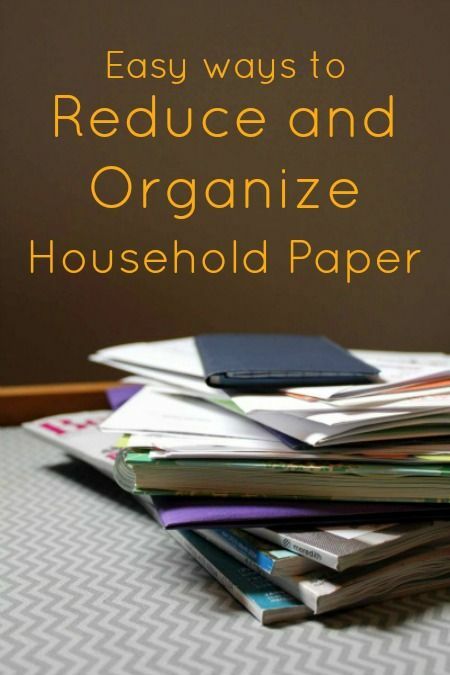 Frugal Living NW has some great ideas for organizing your paperwork. Deal with it right away. Don’t let the paperwork pile up and turn into a big mess. When something comes in the mail, immediately assess whether or not you need to keep it. If it’s something that can be tossed, then toss it. If it’s something that you need to keep, then file it right away. De-clutter your filing cabinet once a year. Every January, go through your filing cabinet and get rid of the things you don’t need anymore. Do you really need a file about that credit card that you no longer have? Probably not! So get rid of it to make space for more important things. Go paperless! The vast majority of companies have a paperless option. Use it. Not only will you cut down on the paperwork clutter in your home, but you’ll also be helping the environment out by using less paper! My husband and I have several shared Evernote Notebooks we use to store important info that may have originally been on paper. Oh, the medicine cabinet. It’s a rarely seen cabinet in the house that gets neglected and cluttered up in no time. Also, if you live with other people *ahem, husband*, they may not help you in your dreams for Marie Kondo level organization. Every six months, go through your medicine cabinet and throw out any medicines or products that are expired. 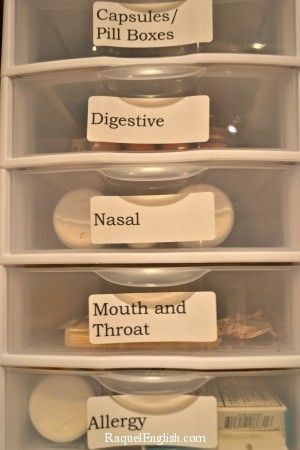 Also, get one of those little, plastic drawers from At Home or Target and use it to organize your medicines by category. Then, make sure that anyone else who lives in your house is aware of the system so that they can also (hopefully) stick to it! 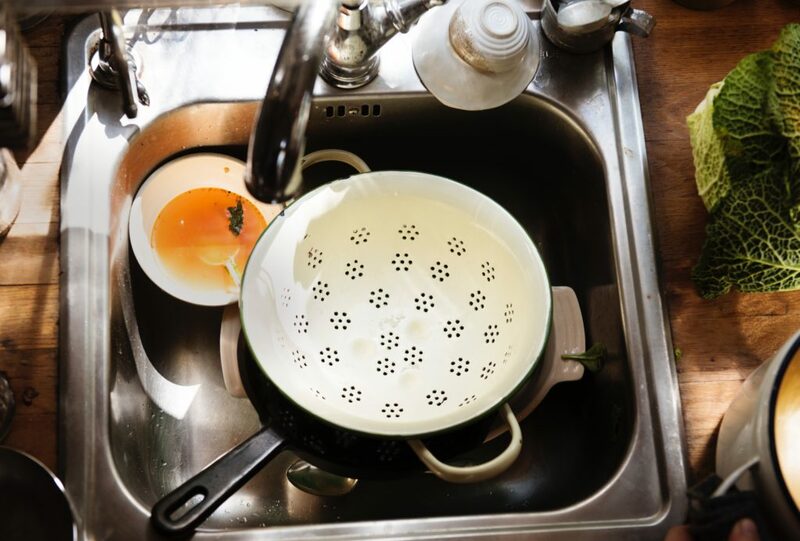 One of the most common things that seem to pile up is dishes. It’s so easy to just throw them in the sink, or on the counter and think that you’ll get to them later. But then later turns into even later, and before you know it you have a huge pile of dirty dishes in your sink and on your counter. The trick? Do your dishes after each meal. Take a few minutes to load the dishwasher, wash the dishes that need to be hand-washed and wipe up the counters whenever you’re done in the kitchen. That way, when you come back for the next meal, you’ll be greeted with a shiny, clean and clutter-free work-space that will make your heart sing! Also, you’ll spend a lot less time scrubbing dried-on food off of your plates, because they won’t have been sitting there drying for hours and hours! Another trick that works for us, sort of, is a division of labor. I really dislike doing dishes and my husband hates matching toddler socks. So, for most weeks he does the dishes and I’m in charge of laundry. It doesn’t always pan out like this, but it’s our goal. The fifth, common clutter culprit that we’re talking about is laundry. It seems like no matter how often you do a load, there’s another one ready to be done. It truly is the chore that never ends (especially for those of you with giant babies tiny humans in your homes)! Keep it organized. Decide on categories of laundry (i.e. dark clothes, light clothes, delicates, work clothes, etc.) that make sense for your household, and then have a laundry basket for each of them. I know that there are lots of cute hampers out there, but having all of your laundry thrown in the same basket can make it overwhelming when it’s time to do it! 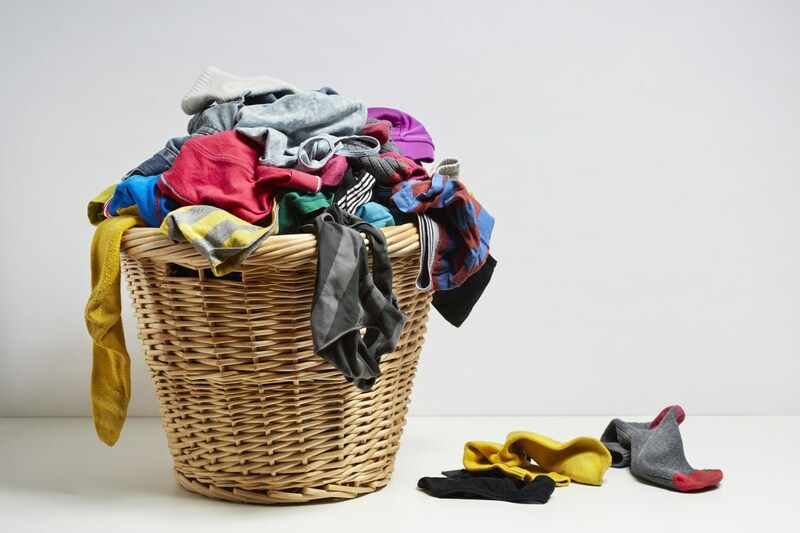 Inform the other members of your household (if they’re old enough, of course) which clothes belong in which basket so that they can make sure that their laundry gets where it needs to go (so that you’re not sorting through everyone else’s laundry for them). Labels are perfect! Don’t forget it in the washing machine. Whatever you do, don’t forget your laundry in the washing machine! Then you’re stuck with doing the load all over again to get rid of that musty, wet smell. If your washing machine is out of sight, set a timer to remember that it’s time to go switch it to the dryer. Fold it right away. After you’ve dried your laundry, fold it right away. Don’t leave it in the basket or dryer overnight, because then you’ll just end up with a bunch of wrinkled clothes. Put it away. Once it’s folded, PUT. IT. AWAY. Don’t leave it sitting in a pile on the floor, table, couch, bed, etc., because then it will just get shoved to the side or knocked over, and you’ll be stuck folding it all over again. Take five minutes to put it where it belongs, so that it’s easy to find what you’re looking for the next time you’re getting dressed! What are your favorite de-cluttering hacks, tips or tricks? Have you tried any of the above? What do you think could help you de-clutter your space? Let us know in the comments!